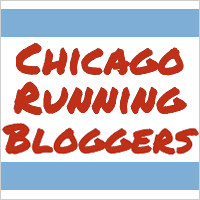 Because I’ve been planning on running the Chicago Marathon pretty much since last September, I really front loaded my race calendar this year, which means I’ve run a whole lot of races since mid-February. I’ve been planning on Ravenswood for awhile, but I didn’t plan on actually running it. I conned a non-running friend of mine into doing a 5K back in December, and Ravenswood was the 5K we settled on. Then my friend got busy and didn’t have time to train, so she opted to walk the race, and well, online race results are forever, y’all, and I have a reputation to maintain 😉 So I ended up running it, but more on that in a bit. I picked up my packet at Fleet Feet in Lincoln Square on Saturday, which, for those of you keeping score at home, was the third time I went to the Lincoln Square Fleet Feet in the space of six days. Whoops. All were for legitimate reasons (a failed quest to get a Runners for Boston shirt that ended up in me spending lots of $$$ on socks [double whoops], a Boston memorial run on Monday, and then packet pickup of course), but when walking around the race site Sunday morning and thinking, “Hey, I recognize that Fleet Feet employee!” I realized that just maybe I’ve been spending a bit too much time there lately. Haha. Anyway, the packet was nothing to really write home about. Lots of advertising for future Fleet Feet races and a couple 10Ks. I really like the design and color of the shirt, but it’s a little, um, sheer. Yikes. So that’ll be my go-to shirt when it’s 90 degrees and humid, but probably won’t make it out of my closet much beyond that. Ah well. I didn’t run this race for the shirt, so no love lost. I got to the race site 45 minutes before the actual race and milled around with one of my other friends while waiting for my non-runner friend to get there. Pretty soon after we met up with her, it was time to head over to the start. I’ve done (arguably more than) my fair share of races in Chicago, and it was so nice to run a race not on the Lakefront Trail for once. Lining up to start on Hermitage gave the race a good neighborhood feel that I definitely liked. Because I’ve been shin splinted since Shamrock, I’ve barely run at all lately. I ran the day of the Boston Marathon and at Fleet Feet last Monday, but that’s it. I really had no expectations heading into Ravenswood, but I wanted to see how I could do, especially on pretty much no training, so I seeded myself between the 8:00 and 8:30 milers. I knew it was probably ambitious to expect to PR, so I promised myself I’d give it my best effort and not beat myself up over time. I only looked at my watch to see where I was on the course and never once looked at my pace. I was pretty happy, then, when I had an 8:16 split for the first mile. That’s just about as fast as I ever run and I was still feeling pretty good at that point. Mile #2 wasn’t quite as hot. My legs were definitely a bit tired and it felt like the first half mile was soooooo long, but the second half went by pretty quickly. I ran an 8:26 second mile (rawr. Missed a negative split AGAIN.) and though I really wanted to give it my all for the last 1.1, I wasn’t so sure what exactly “my all” would look like. My legs were tired, my stomach was cramping, and just in general I felt pretty lousy. The clock at Mile 3 was somewhere in the neighborhood of 25:4x when I passed it, so I figured I had lost any chance at a PR. When my Garmin registered the third mile, though, I saw that I had run it in 8:07. That put my total time at 24:49 at the 3 mile mark, which made me think a PR was still definitely within reach. I took off for that last .1 miles (ran a 6:08 pace!). Buttttt no dice. When I stopped my Garmin, it said 25:27; my official results say 25:29. My 5K PR is 25:24. Sighhhhhh. I’m trying to not be super annoyed by it, but…I’m kinda super annoyed. I mean, I know for sure that I gave the race my best effort. There’s really no place that I can point to and say, “Yes, I could have run a little faster there,” so I at least have that. It’s just annoying to be sosoclose, you know? Ugh. I’m totally turning into that definitely-runs-for-time runner I never, ever thought I’d be when I ran my first 5K. Even though I’m a little frustrated about my time (really, more frustrated about the fact that my PR streak–I’ve PRed every race I’ve run since October, which is seven PRs in a row, though five of them were cheater PRs because they were new-to-me distances–ended), I enjoyed the race. Fleet Feet knows what they’re doing, and I’ve never had a bad experience at any of their races (which, yes, I’ve only run two…but whatever. They were both very well organized, and I appreciate that). I really liked running through Ravenswood, I’m head-over-heels in love with Lincoln Square, and all the turns made the race seem a lot faster than your standard out-and-back-on-the-trail number. I am now done racing for three whole months. Whoa. To be honest, I’m actually a bit nervous about it. I love races, but I know I need to get myself ready to run the marathon in October, so racing has to take a back seat to general training. Races keep me motivated, so I’ve got two planned during training, but other than that I’ll just be pounding out miles for the sake of marathon prep. I will say, though, that I’m THRILLED to be done running fast. Long slow runs are my favorite, and there’s nothing long or slow about a 5K. 5Ks just kill me. I like that they give me the chance to gauge how fast I’m able to go, but I really prefer not hating everything about life when I’m out on a run, and that’s how I tend to feel on those speedy 5Ks. Bring on the slow runs! I HATE when you’re like 3 seconds off of a PR. Last year I was 3 seconds off of breaking 43 at conferences in the 10K and I remember being so mad at myself even though I couldn’t have really worked much harder since I pretty much collapse every time I cross the finish line. I agree with the being happy about no more fast runs. I would rather run at a 10 minute pace for 20 miles than run at a 6 minute pace for 3 miles. There’s just something so unappealing about feeling like you’re going to puke from running so fast. Tell me about it. I run because I enjoy running, not because I’m out there to win (HA. Pretty sure I’d have to enter a race with a field of five people, none of which had ever run before or had any interest in running, to ever win a race). Feeling like I’m about to puke is the opposite of enjoyable…although I guess I do enjoy fast times. Such a conundrum! I ALWAYS end a race thinking “what if I had…” But it’s really no use. Still, just think about how good your conditioning is that you could take some time off running and still get so close to your PR! Yeah, I am really, really proud of that, not to mention really surprised! I’m starting to think hip hop and breakdance have done me a lot more cardio good than I ever imagined…although I imagine all my Jillian Michaels DVD-ing hasn’t hurt, either! Ok usually i get so excited about races that’s all i want to talk about buuuut that french toast put that completely out of my head 😛 that looks amazing….i think I’m coming to chicago just to go there with you! I hear you on being irked with times in races haha, but I still think you creamed it 🙂 can’t wait to hear how marathon training goes! Edgewater reporting! Don’t tell people the secrets we have! But that French toast looks great! It was fabulous French toast! Highly recommended! For some reason your posts are really delayed in my reader… this one hasn’t even shown up yet??? Anyway congrats on an awesome race! Bummer you didn’t PR but haven’t you taken time off lately for shin splints? Considering that, you still had a fast run! I’m excited to read about your marathon training as well :). Thanks, though! I ran about seven miles total in the three weeks between Shamrock and Ravenswood, so I guess overall I’m really pretty glad that I was able to still be speedy for me with so little training. One and a half months until marathon training officially begins! Eek! Absolutely. Talk about a great way to start your Sunday! Seconding Lindsay’s comment – this post just showed up in my reader. Maybe google reader is cutting out early before it’s final exit in July? You obviously should have just sandbagged more of your earlier races so you could still be PRing. Duh. But in all seriousness, the streak had to end somewhere and you went for a long impressive time. Dang it, Google Reader! You’re ruining my site stats! Rawr. I mean, obviously. If only I had more foresight! And you’re right. I think I’ll be a lot less tempted to want to PR at my July race now, which is good, because I’m probably going to need to treat that more as a training run than a race, since it’ll be during marathon training. I can almost guarantee you that on June 29, I will frantically trying to find a new reader option for blogs. Until then I will continue living in denial. so I guess we are in the same boat. This post just showed up in my reader too by the way…. I am not racing again till August. I think I need the more lax training time and also time to stalk races. I have to say though I am bummed you ran for Fleet Feet, it is our rival store here in dc of where i work now. So… can we still be friends?